Biopsy - biopsy is a surgical procedure to remove a small piece of tumor in order to confirm the diagnosis. The sample is examined under the microscope by a pathologist who determines the type of the tumor. A biopsy can be performed as part of the surgery to remove the tumor or as a separate procedure. 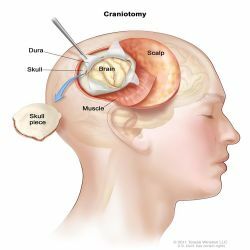 Craniotomy - The most commonly performed surgery for removal of a brain tumor is called a craniotomy. “Crani” means skull, “otomy” means cutting into. In preparation for a craniotomy, a portion of the scalp is usually shaved, and an incision is made through the skin. Using specialized equipment, a surgeon removes a piece of bone to expose the area of the brain over the tumor. The dura mater (the outermost layer of the brain tissue) is opened, the tumor is located and then removed (resected). After the tumor is removed, the bone is usually replaced and the scalp stitched shut. Craniotomy is an operation where a disc of bone is removed from the skull using special tools to allow access to the underlying brain. A craniotomy involves making an incision in the scalp and removing a window of bone from the skull (this bone is secured back in position at the end of the operation). This allows access to the inside of the skull and brain, and the tumour is either biopsied (a small piece taken to be sent to the pathologist), or excised (removed). The hair on the scalp is shaved. Patient is given a general anaesthetic. The head is placed on a round or horseshoe-shaped headrest so that the area where the brain injury is thought to lie is easily accessible. If head movement must be minimised, head is clamped into place with a head pin fixing device. Through preoperative imaging, the neurosurgeon determines the most appropriate site for the craniotomy. The procedure begins by first cutting through the scalp. Small holes (burr holes) are drilled into the exposed skull with an instrument called a perforator. An instrument called a craniotome is used to cut from one burr hole to the next, creating a removable bone flap. The membrane covering the brain is opened, usually as a flap. The brain injury or disease is operated on – for example, ruptured blood vessels are repaired, or the blood clot or tumour is removed. After the operation is finished, the piece of excised bone is replaced, the muscle and skin are stitched up and a drain is placed inside the brain to remove any excess blood left from the surgery. A craniotomy can take about two and a half hours. Patient is expected to stay in hospital for between five days and two weeks. The length of stay depends on many factors, such as the type of surgery you had and whether or not patient experienced complications or required further operations. Stitches (or staples) are usually removed about one week after surgery.Ptient may experience headaches for about two weeks.Walking is a recommended form of exercise. Patient should wait at least three months before they return to gentle, non-contact sporting activities. Contact sports should be avoided for at least one year.Physiotherapy, occupational therapy and speech therapy can help to manage any neurological problems like clumsiness and speech problems. Usually, therapy is only needed if there were neurological problems before surgery.